Its true, you either love it or you hate it. Personally, I love using Marmite in cooking and baking. My favourite being these marmite baked rolls which are perfect when dunked into a big bowl of homemade soup. Even the not-so-lovers cannot deny the rich malty flavour it lends to meat and sauces so well. If you haven't before, try a small dollop when making your next Bolognese, its the definition of savoury umami. Umami, known as the fifth taste, occurs naturally in foods when ingredients with umami-giving compounds are combined. They enhance each other giving more flavour 'than the sum of its parts'. 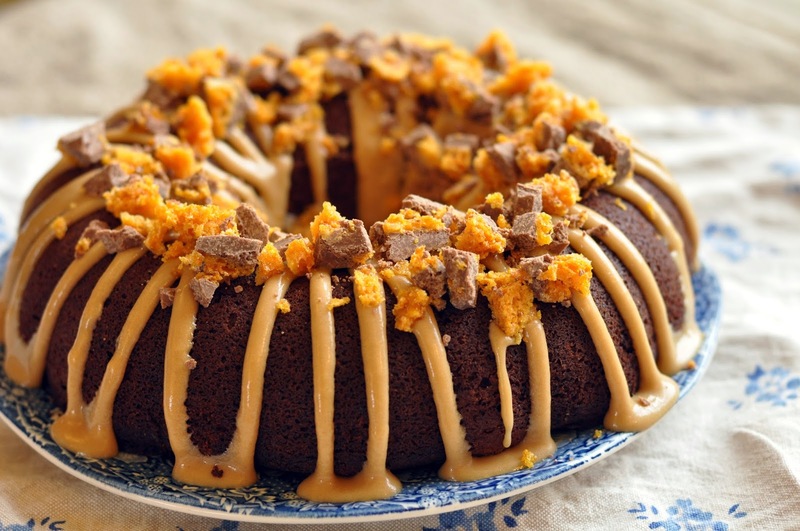 Since having recently triumphed making my own caramel, I was curious to find a recipe for a chocolate and Marmite salted caramel cake in the Clandestine Cake Club Cookbook. I decided to give the umami flavour a go in this weekend's baking. Heat the oven to 180 degrees and grease a bundt tin. Alternatively, use a deep 7" cake tin. Cream together the butter and sugar until light and fluffy. Add in the egg yolks one at a time, beating well after each addition. Gently stir in the melted chocolate and ground almonds until well incorporated. In a separate bowl, whisk the egg whites to soft peaks. Gently fold in the egg whites and flour into the butter mixture. Pour in the bundt tin, smooth the top with a spatula and bake for 30-35 minutes. Once a skewer inserted into the middle comes out clean, remove from the oven and leave to cool completely in the tin. Say a little prayer when upturning onto a plate! Melt the butter in a large saucepan over a low heat. Add the sugar, milk and Marmite and stir continuously until it comes to the boil. Leave to boil for 1 minutes and transfer to a large bowl. Whisk in half the icing sugar and leave to cool. Keep checking and stirring whilst its cooling to regulate consistency. Once cool, whisk in the remaining icing sugar, adding more if too runny. I used a piping bag to drizzle the buttercream over my bundt. If you use a regular cake tin, either top the cake with it or slice in half and use buttercream to sandwich the two layers together. My friend made this honeycomb for me so I decided to use it to crown my bundt. 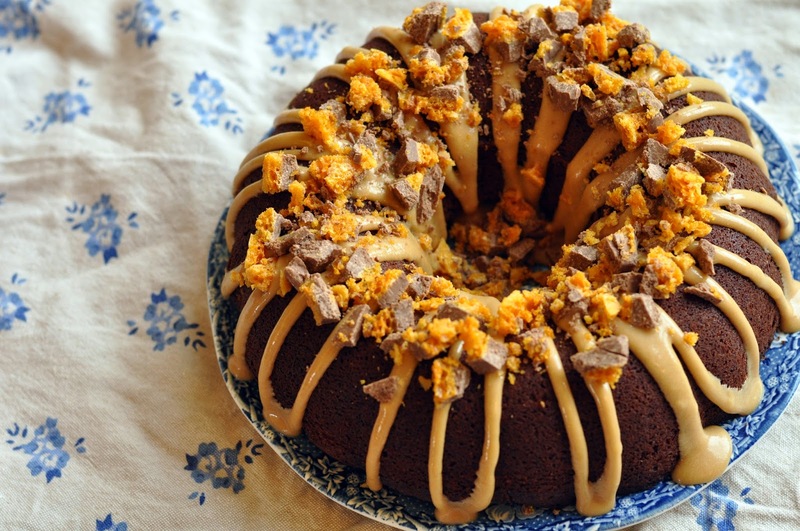 She used the BBC Good Food recipe, and when topped with chocolate tastes just like a Crunchie bar, but better. When presenting this to my family after dinner yesterday I decided to keep the Marmite aspect quiet. It was one of those moments where you cannot guess, but once told, it was obvious. 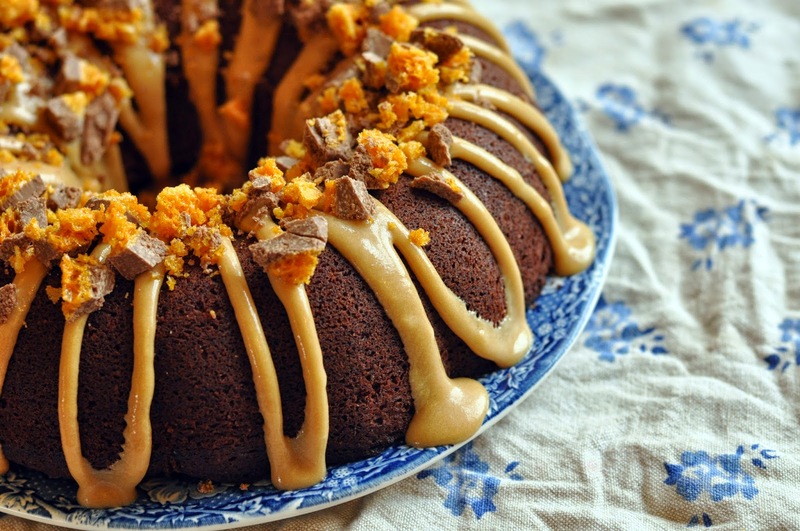 Unusually, Marmite's worst fan favoured this cake the most. My verdict, I'm still not convinced, but would definitely try making it again with less Marmite in. So if you're a Marmite lover and fancy giving it a go, let me know your findings. A rather big side note...I followed the buttercream recipe exactly to make the layer cake from the book. Not only did it make a massive amount, I feel that less Marmite could have been used. My advice would be to reduce the Marmite and/or make half the quantity. And if you're looking for more umami-inspired sweet bakes, Lucy's peanut butter and soy salted caramel millionaire's shortbread looks amazing. Whilst you're there, have a little drool over her amazingly talented photography.